December 5, 1937 – “From a muddy, narrow, unkempt and little used dead-end street to one of the world’s most famous thoroughfares is the remarkable metamorphosis brought about in less than two decades by the erection of an eight million dollar bridge over the Chicago river.” [Chicago Daily Tribune, December 5, 1937] Thus begins the Chicago Daily Tribune’s feature on the changes sparked by the Michigan Avenue bridge in the 17 years since it opened. When the bridge opened on May 14, 1920, Chicago, for the first time, saw the north side and the south side of the city connected by means of a wide thoroughfare and a dependable way across the river. Two tall buildings at opposite ends of North Michigan Avenue were completed the same year that the bridge opened – the Drake Hotel to the north and the Wrigley building next to the river. A year later the Tribune printing plant was completed, along with the Lake Shore Trust and Savings Bank building. In 1923 the London Guarantee and Accident building, today’s London House Hotel, opened. A year after that the second half of the Wrigley Building was completed, along with the Allerton Hotel and the Central Life building, followed in 1925 by Tribune Tower, the Michigan-Ohio building, the 900 North Michigan building, the Tobey Furniture building and the Women’s Athletic Club. In 1926 The Lake Michigan Building and the 840 North Michigan building were completed, followed in late 1927 by 333 North Michigan Avenue. Ten structures rose skyward in 1928 – the Palmolive building, the Drake Towers, the Women’s Athletic Club, the Farwell building, the 700 North Michigan Avenue building, the 733 North Michigan avenue building, the Medinah Athletic club, the McGraw-Hill building, the Decorative Arts building, and the Carbide and Carbon building. Three more buildings were completed in 1929, the year that the world economic boom came to an end – the Michigan Square building, 430 North Michigan avenue, and 669 North Michigan. Many of these buildings are gone today, but a substantial number are still with us, proclaiming that, in the decade that followed the opening of the bridge at Michigan Avenue and the widening of muddy Pine Street on the north side of the river, thirty-three substantial buildings, costing approximately $70,000,000 were constructed. 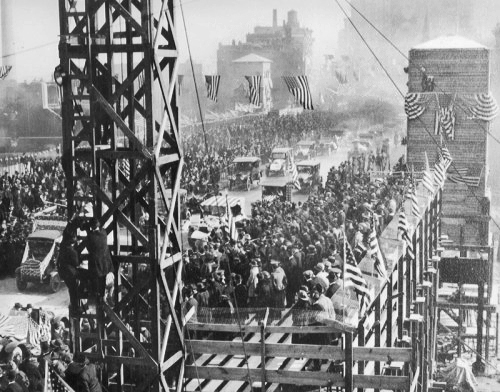 The article ends with a quote from architect Ernest Graham, who observed, “The Michigan avenue bridge was going to cost about $800,000, according to preliminary estimates; actually it cost eight million, and it’s been worth more than eighty million dollars to the public of Chicago.” The above photo shows the opening of the bridge in May of 1920. December 5, 1892 – There are four stars on the flag of Chicago, each star corresponding to a key event in the city’s history. If there were to be a fifth star – astonishingly, it was not assigned to the 2016 World Series victory of the Cubs – it might very well be given to a case decided in the United States Supreme Court, the results of which were published on this date in 1892. The case pitted the State of Illinois and the City of Chicago against the Illinois Central Railroad in an effort to “obtain a judicial determination of the title of certain lands on the east or Lake-Front of the City of Chicago, situated between the Chicago River and Sixteenth street, which have been reclaimed from the waters of the lake and are occupied by the tracks, depots, warehouses, piers, and other structures used by the railroad company in its business, and also of the title claimed by the company to the submerged lands constituting the bed of the lake, lying east of the tracks, within the corporate limits of the city for a distance of a mile, and between the south line of the south pier near Chicago River extended eastwardly, and a line extended in the same direction from the south line of Lot 21, near the company’s round-house and machine shops.” In a lengthy explanation the court found that the city was not deprived of its riparian rights by a previous decision to allow the Illinois Central to construct tracks and a breakwater along the lakefront between Randolph Street and Park Row. The court said, “With this reservation of the right of the railroad company to use the tracts on ground reclaimed by it and the continuance of the breakwater, the city possesses the same right of riparian ownership, and is at full liberty to exercise it, which it never did.” [Chicago Daily Tribune, December 6, 1892] Writing for the majority, Justice Stephen J. Field stated, “It is the settled law of this country that the ownership of and dominion and sovereignty over lands covered by the waters, within the limits of the several states, belong to the respective states within which they are found, with the consequent right to use or dispose of any portion thereof, when that can be done without substantial impairment of the interest of the public in the waters, and subject always to the paramount right of congress to control that navigation so far as may be necessary for the regulation of commerce with foreign nations and among the states.” The case has tremendous implications for the future of the city’s lakefront, which up to this point, had been expanded through landfill with parcels from north to south being claimed by property owners claiming that because they owned land adjoining the lake, they also owned the riparian rights and therefore could expand their property as far as they desired. In short, the city would look far different today if the case in 1892 had turned in a different direction. The photo above shows the lakefront just north of today's Art Institute probably in 1891 or early 1892. The portion of the lake that we can see, which is west of today's Columbus Drive, is part of the property included in the suit before the Supreme Court.